According to the National Coalition Against Domestic Violence, almost 20 people per minute in the United States are physically abused by a romantic partner. Over the span of one year, this totals over 10 million women and men who are victimized by their partners. Equally as alarming, 1 in 3 women and 1 in 4 men have been victims of some form of physical violence by an intimate partner, and 1 in 7 women and 1 in 8 men have been stalked and feared for their lives. At SUNY, we continue to work toward ultimately bringing an end to domestic violence in New York. That’s why once again we have joined the “Shine the Light on Domestic Violence” campaign, sponsored by the NYS Office for Prevention of Domestic Violence (OPDV), to build awareness about the resources available for victims of domestic abuse and their families. There has been a lot of work in recent times developing our own resources and efforts to help support victims. If you’re not familiar, here’s some information to raise awareness of the efforts taking place at SUNY. For many of our students, college marks the first time they’re living on their own and are away from their support systems. Our Sexual Assault & Violence Response (SUNY SAVR) Resources offer support and reporting resources for victims and survivors of sexual assault so they don’t have to feel alone. SAVR includes information on affirmative consent definitions, SUNY’s Drug and Alcohol Amnesty policy, and the Student Bill of Rights. The website also provides resources by campus, such as contact information for counseling offices, Title IX coordinators, university police/campus security, and more. In addition, students have access to off-campus resources by searching their zip code. For students who are not native English speakers, the website can be translated into over 100 languages, which may provide students with comfort during a traumatic time. Information on how to contact the police to file a police report, how to receive medical attention and counseling, and other reporting resources can be found on SAVR as well. Overall, SAVR is a one-stop resource for students to help out a friend or support themselves. 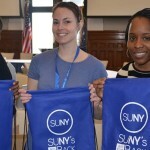 Outside of technological resources, SUNY partnered with the NYS Coalition Against Sexual Assault, the NYS Coalition Against Domestic Violence, and SUNY Title IX Coordinators Association to create SUNY’s Got Your Back. The mission of SUNY’s Got Your Back is to collect comfort kits for victims and survivors of sexual and interpersonal violence across New York State. 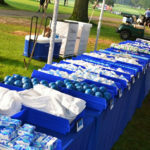 The bags include items like shampoo, soap, lotions, dental care, tissues, notepads, and more. These bags help victims feel a small sense of comfort and have access to some of the necessities to aid them in the recovery process. 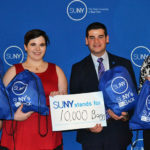 This year, SUNY partnered with the PGA TOUR in events near Binghamton and Old Westbury, which resulted in 10,000 bags being filled to give to regional sexual assault and domestic violence shelters. In total, we have put together and donated around 20,000 comfort bags and we don’t plan on stopping! The PGA TOUR and PGA TOUR Wives Association also donated $15,000 to the SUNY’S Got Your Back Program, which will help our program grow and provide more support to victims and their families. It’s on all of us to be educated on how to prevent and respond to sexual and interpersonal violence. 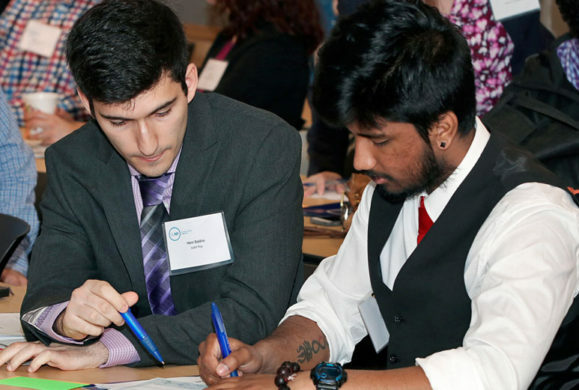 As a result, SUNY, along with CUNY and the NYS Department of Health, developed a training program that’s used at more than 140 colleges nationally. The online course is customizable for all universities and is based on the standards set by the “Enough is Enough” legislation. SPARC trains police, educators, and community leaders on how to thwart sexual and interpersonal violence on college campus and highlights the importance of sharing resources with students. The ultimate goal of SPARC is to help individuals see that it is the collective responsibility of higher education to do what we can to prevent sexual assault on our campuses and make sure every measure is taken when investigating allegations of sexual assault on campuses. Domestic violence doesn’t discriminate and affects people from all walks of life. To successfully eradicate the horrible acts of domestic violence, SUNY and Governor Andrew Cuomo created a partnership, establishing a unified force to address sexual violence. Out of the partnership came the development of a statewide, uniform policy to combat sexual assault on New York college campuses. The policy includes a uniform definition of consent, a uniform amnesty policy to encourage reporting, a comprehensive statewide training for campus police and college administrators, a statewide public awareness campaign, a uniform confidentiality and reporting protocol for all SUNY campuses, and uniform campus climate assessments. The SUNY sexual assault policy also created a Sexual Violence Victim/Survivor Bill of Rights. All students are notified of the Bill of Rights, which includes their right to report the assault to local, campus, or State law enforcement. Similar to previously mentioned SUNY efforts, the Bill of Rights also explains how students can find campus-specific resources, including obtaining a restraining/no contact order and counseling, health, legal, and support services. 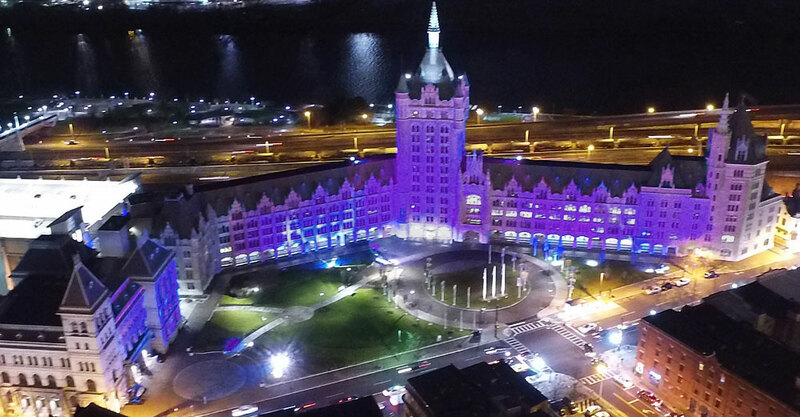 Since 2008, the New York State Office for Prevention of Domestic Violence (OPDV) has turned the state purple, from notable buildings, to fountains, to whole neighborhoods, to shine the light on domestic violence. 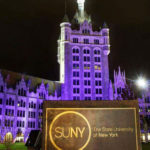 Each year, the historic SUNY Plaza building in downtown Albany is lit with purple for the entire month of October to show a symbolic action of support from SUNY during this month of reflection, and hopefully, action. The vivid light helps call attention to resources and support available for victims of domestic violence and their loved ones. To get involved with the 10th anniversary of Domestic Violence Awareness Month, wear purple on Thursday, October 19. If you take any pictures of yourself wearing purple, make sure to upload them to your favorite social media platforms and include the hashtags #ShineTheLight and #DontDoNothing in your captions. Getting involved on individual campuses and communities is a great start, but make sure to check out the OPDV’s Shine The Light toolkit for more ways to stand with victims of domestic abuse. Together we can, and will, make a difference.